The recent outbreak of the Ebola virus in Africa has been frightening. According to The World Health Organization, it is known to have affected 1100 people and the current death toll is 887 (as on the 6th of August, 2014). The possibility to spread to other countries including India is high due to which we need to be aware of the epidemic and be prepared to safe guard ourselves. The first outbreak was in 1976 in Sudan, Nzara and the Democratic republic of Congo. Later, it was reported in a small village situated on the banks of the river Ebola from which the disease takes its name. This virus has been found in Chimps, African monkeys and other nonhuman primates. What are its causes and how is it transmitted? • Contact with blood, organs or other bodily fluids andsecretions of an infected person or an infected person who has passed away. • Handling meat of infected animals. The high risk individuals include diabetics, immune compromised patients, patients with kidney and liver failure and HIV infected people. The early symptomsinclude rashes, fever, nausea, headache, vomiting and stomach pain, arthritis like pain all over the body, pain in the lower back, diarrhea and a sore throat. • Bleeding from the ears, mouth, nose and ears. • Reddening of the roof of the mouth. • Avoiding crowded places that is known to have an outbreak. It is also important to visit the doctor immediately if the above mentionedearly symptoms are noticed. • Practice basic hand hygiene. Wash your hands frequently using water and soap. If water is not available, use hand rubs with at least 60% alcohol. 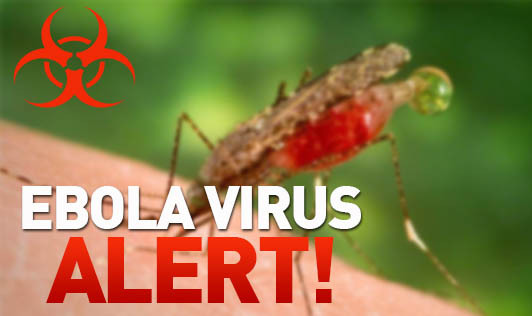 • Try to avoid traveling to areas with known outbreaks of the Ebola virus. • Avoid contact with infected people. It spreads through direct contact with an infected person's secretions, organs, blood, and other bodily fluids. • Wear protective clothing, such as long sleeved gowns, masks, gloves and eye shields. • Do not consume bushmeat (meat that is got from wild animals in Africa, Asia and South America). • Keep infected people isolated from other people.